Although "interdisciplinary" has become an international buzz word, separate trainings remain the norm in the US and most other parts of the world. Yet the value to performers in a more comprehensive approach can be enormous, as singers, actors and dancers seek to diversify skills, work across media, and access multiple styles. For voice teachers, the biggest gap in both singing and acting training is typically that between voice and dance. Therefore, dance pedagogies figure prominently in the initial work. 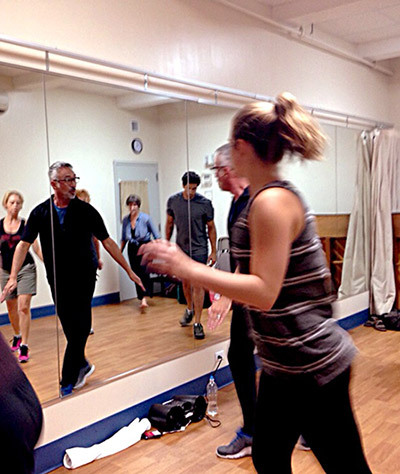 Likewise, dance teachers and choreographers need to understand the training backgrounds of actors and singers in order to ensure movement is sympathetically created to encompass vocal requirements. Therefore, voice and acting pedagogies are integral to the curriculum. While participants will not be expected to develop advanced skills in all areas, they should come out with an awareness of the physical requirements and technical language of related disciplines, and enough practical experience to communicate across boundaries. Please contact Joan Melton at joan.melton@joanmelton.com if you have questions or need additional information. What, specifically, would you like to be able to do as a result of completing the course? What are your strengths as a performer, teacher, coach, and/or therapist? What areas do you want to explore and/or strengthen, e.g., research skills, musicianship, acting (training/experience), knowledge of anatomy/physiology, speech/dialects, dance techniques, vocal coaching in a variety of venues? Are you interested in: 1) certification; 2) the introductory course only; or 3) are you unsure at this point? Please send application materials to Joan Melton at joan.melton@joanmelton.com.